Pool 8 Ball Billiards Pro is a free Pool game for Windows 8 and 8.1 computers. If you love playing pool, but it has been some days since you played, and you require practice, then this is the perfect game for you. This pool game for Windows 8 is addictive, and a good time killer. The exciting graphic keeps you glued to the game. It can be played on both Computers and Touch Tablets. To install this Pool game for Windows 8, go to the Windows 8 App Store and search for the game with its name. This game barely occupies any space, and provides a good entertainment. With a size of 245kB it can be downloaded and installed real quick. Follow the Download Link at the end of this article if you are unable to find it on the Windows App Store. This pool game for Windows 8 is a piece of cake to play, but it really is an addictive pool game. Click on the huge Play button on the start screen to begin playing. Read the instructions before you begin to play. You need to tap and drag on the Cue ball to aim, and pull the cue in opposite direction of target to increase the hit strength. Simply release the button to hit the cue ball. For each ball place in the hote, you are awarded with some point. Now, you only get 2 minutes of gameplay. You have to score as much as you can in a single game. Once all of the balls go down the holes, a new set appears. The more balls you pot, the more sets will appear within two minutes. For potting consecutive balls, you get extra points. For the first ball you pot, you score 100, for the second ball potted 100+20 points are awarded. This continues till you break the streak. A game summary is displayed at the end of the game. This screen automatically appears once the 2 minutes are over. 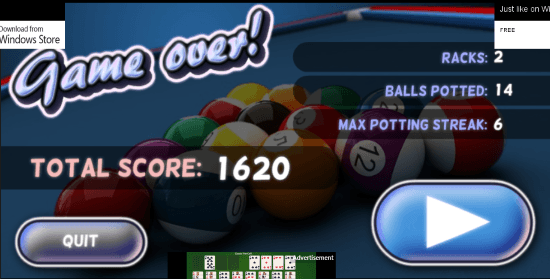 This pool game displays the total number of racks played, number of balls potted, and the maximum streak along with the Total Score. Keep playing this pool game for Windows 8 to break your own records. This is a simple pool game for Windows 8 with decent graphic and sound effects. You can keep playing this game, and never get bored. 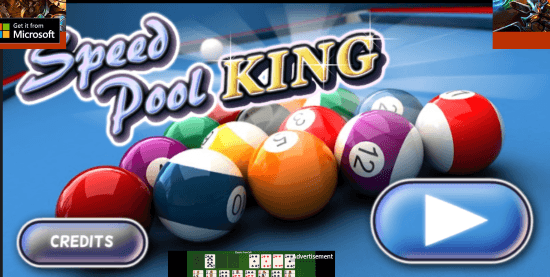 Download Pool 8 Ball Billiards Pro for Windows 8 and 8.1 computers, today.